Puja Room is recommended in North-East (Ishan) corner. However, one should also make Puja room in North or east direction. We worship in fewer clothes and thus receive Vitamin D emanating from morning sun rays in its innate state. We also receive favourable effects of earth’s magnetic energy from the northern region and the region is acknowledged as the most sacred one because we also receive some supernatural energy and cosmic energy from the atmosphere in this region. This is why the entrance gates of temples are built in this direction and there is a provision for leaving this region more open. There are certain rules which one must follow before the deciding the orientation of Puja room. Puja room should never be made in a bedroom or on a wall adjacent to the bathroom wall. Ideally there should be no idols in the Puja room. But if one wishes to keep, the height of the idol should between 2″ to 9″. During worship, face should be kept towards East or North direction. While worshiping, the legs of the idol should be at the chest level of the person worshiping depending on the position, whether standing or sitting. Nothing should be stored above the cabinet or slab where the God’s idol is placed. In Puja room, copper vessels only shall be used particularly where water is collected. Triangular pattern of any God should not be drawn in the Puja room. The colour of walls of Puja room should be white, lemon or light blue and the marble used should be white. The doors and windows should be in the north or east direction. 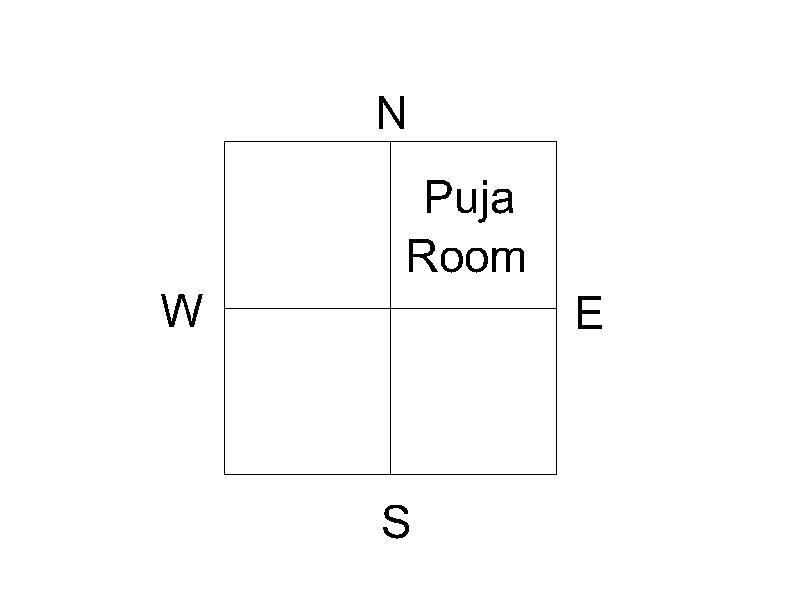 The Agnikund should be in the southeast direction of the Puja room. The sacred offerings to the fire should be made with the face towards the east. Lamp stand should be placed in the Southeast corner of the Puja room. It is always advisable to have a Tulsi plant in the Puja room since it is regarded as the most sacred of all herbs.